Knitting has been a passion of Alissa’s since she was 4 years old and her grandma told her she was "too little to knit". Alissa learned anyway, and hasn't stopped learning ever since. Continually learning more efficient ways of accomplishing her work is what she likes best. Alissa considers sharing her love of knitting with others is a privilege. When Alissa operated her own yarn store she loved getting to know the knitters who would come to her shop. Alissa likened it to being a bartender. Sitting around, sharing stories and helping others without the hassles of running a business is what she is looking forward to most on a knitting cruise. Alissa Barton, sometimes referred to as the Knitting Fairy, is known for her whimsical patterns and unique accessories. The classes Alissa teaches all come from questions her students have asked - why would I choose to SSK instead of SKP? How do I knit a dinosaur into my grandson's sweater? Help me make a lace shawl for my daughter's wedding day, please? As I answered these questions classes began to form and people are ALWAYS asking for more. Alissa has selected her most popular classes to share with you and she can't wait to share her knowledge while exploring together. When Alissa is not knitting, you can find her working in my succulent garden or reading. She enjoys historical novels, archeology journals, science fiction, and cozy murder mysteries. Alissa Barton has always worked in retail, first as a clerk and later as a store manager before becoming the owner of Knitting Fairy Yarn Studio. She began teaching knitting classes while still in high school and has been blessed to make knitting her full time job all of her adult life. Alissa's extensive teaching experience and her passion for “HOW” knitting works make her the go-to person for many knitters. Alissa Barton knows all the best tips and tricks for most knitting techniques. Knitters of all levels appreciate Alissa's great depth of knitting knowledge and skills. There really isn’t anything Alissa cannot teach and she has an inherent gift of explaining techniques in a manner most students can understand. You can find Alissa Barton on Ravelry, Facebook and Twitter as KnittingFairy and as TheKnittingFairy on Instagram. 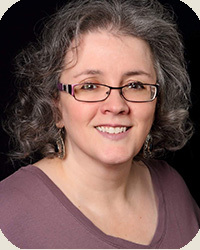 Alissa began publishing patterns in 1994 under the name Knitting Fairy as a result of her intense interest in the “WHY” behind knitting patterns. Nothing thrills Alissa more than finding a new technique or stitch and sharing it with other knitters. She loves to travel and thinks cruising gives knitting enthusiasts an escape from the everyday in an environment that allows time to relax, rejuvenate, learn new skills and make new friends. Author of Knitting with Bamboo Yarn (released September 2018), published in MagKnits (UK based) and Knitting Pattern A Day Calendars. Design Editor for Spirit of Knitting Magazine. Featured in The DFW Designers Collection 2017 and 2018. Designer for many "Of the Month" clubs with Knitting Rose Yarns, Erin Lane Bags. Designer for Brooks Farm Yarns, Knitting Rose Yarn, Buffalo Wool Company, Theodora's Pearls and many more. Alissa has over 80 patterns available on Ravelry. Former President, Vice President, Secretary and Lifetime Member of the Arlington Knitter's Guild, member and frequent presenter to the Dallas Handknitter's Guild, Past President of the Dallas Lace Society. Original teacher and long time supporter of DFW FiberFest. Alissa is a graduate of Plymouth Salem High School in Plymouth Michigan and attended Schoolcraft Community College.